As you know we have been working hard on a new VR platform VRdeck.nl as VRapp was build on some legacy techniques. VRdeck is based on the best open source (VR) code we could find and combined with all the lessons learned this is the best VR platform of the world. We were planning to make the migration to VRdeck as easy as possible, so will keep VRapp alive till end 2018. VRmaser will help paid subscriptions to re-create their VR environment and redirect URLs. Otherwise, you have to upload the content yourself. If you don’t have the original images, just go to the scene and add /original to the url. Start creating your tours and scenes. Take a look at the videos at the right or visit our FAQ. I hope you will take this next step into VR together with us. 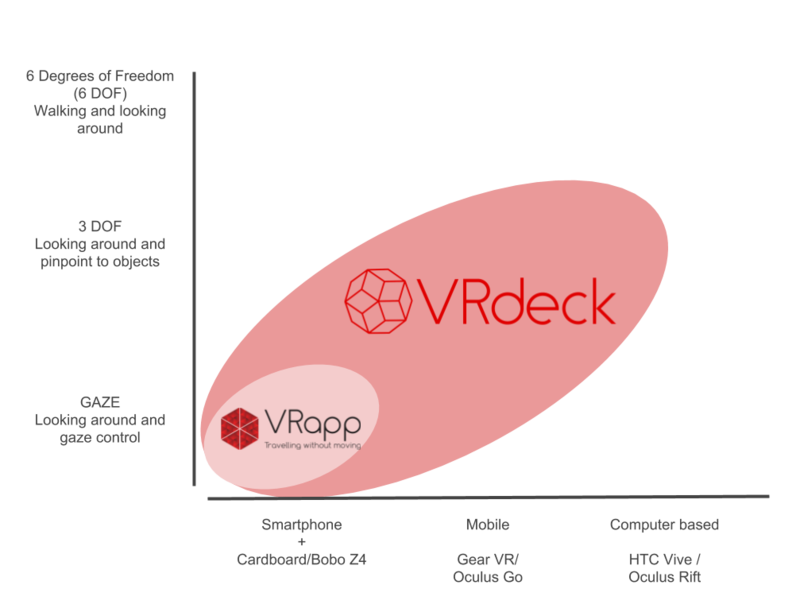 You will need third parties hardware, software and internet services to use VRdeck. Those parties may collect your data otherwise so read their Privacy Policies. Inspire and respect the privacy and feelings of others. If you would hesitate to show your VR content to a child, your family, or a stranger on the street, don’t use that content. Ask permission when you use somebodies portrait. Ask permission of parents or legal guardian’s when a person is 16 years or younger. Only use content that you have created or hold all necessary permissions from the copyright holders. The content you provide to us will be yours and make sure it’s yours and be sure it’s harmless and non-abusive. To experience the best VR experience, use the Firefox browser. Update your device to the latest Operation System (OS). Use a stable internet connection with a minimal download speed of 2 Mbps. A 4G connection has a minimum download speed of 3.1 Mbps. the local network and the Internet connection that is used. Contact us to use VR to the fullest!